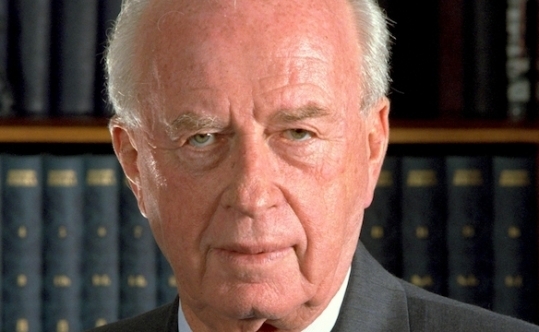 This week the world reflects on the 20th anniversary of Yitzhak Rabin’s assassination. Here are the considered thoughts of someone who knew the man well and who is also a good friend to LDFI. Uri Dromi was amongst other things, Rabin’s Chief of Staff and is someone most of our delegations get to spend an evening with at the Jerusalem Press Club when we visit the Middle East. Uri has fascinating stories and insights and can genuinely say about Oslo “I was there”. His stories about Chairman Arafat and the conduct of both delegations around Oslo have left many a Lib Dem group lost for words (rare). Almost half a century ago, at the Israeli Air Force flying school, I received my wings from then-Chief of Staff of the Israel Defense Forces, Gen. Yitzhak Rabin. Soon after, he became the hero of the Six-Day War, then ambassador to the United States, Israeli prime minister and then defense minister under the National Unity Government. I watched him from afar, being busy with my own military career. Then in 1992, after returning to the prime minister’s office for the second time, he appointed me as the director of the Government Press Office. Thanks to this surprising closing of a cycle, I was privileged not only to be privy to history in the making, but to work for a leader who was a statesman, not a politician. What is the difference between the two? The statesman thinks about the future of his country, while the politician thinks only about the coming elections. Here is an example: One of the main priorities Rabin set for his new government was raising the standards of living among Israeli Arabs. Not that he suddenly became an Arab lover — he fought Arabs most of his life. However, being an honest man, he recognized the decades-long discrimination against the Israeli Arabs — one out of every five Israelis — and decided that he should stop that trend and reverse it. A task force under the director general of his office was established, to launch a campaign of affirmative action in Arab towns and villages. Being perceived as sympathetic to the Arabs wasn’t politically popular in Israel then, as it isn’t today — see Benjamin Netanyahu’s warning on the eve of the last elections, that the Israeli Arabs were “flocking” to the polls. Rabin recognized the potential political damage, but as a statesman, he looked toward a Jewish state where its Arab citizens should feel equal and proud. More dramatic, of course, was his decision to make peace with the Palestine Liberation Organization (PLO). Like the rest of us around Rabin, I was parroting the party line, that we would neither speak with the PLO nor accept a Palestinian state, when the news about Oslo broke. We were first stunned, then puzzled: Had Rabin the hawk turned into a dove just like that? In hindsight, Rabin had given a signal for this amazing change of course. Addressing the Knesset in January 1993, he made a surprise announcement that Iran was launching a military nuclear project. Then he said: “That is one of the reasons why we should take advantage of the window of opportunity and move forward to peace.” None of us in the hall — except Shimon Peres, then the foreign minister — knew that he wasn’t speaking in the abstract, and that as he spoke, the talks in Oslo were gearing up. Iran wasn’t the only reason for Rabin’s surprise move. Professor Shlomo Avinery, a political scientist who had served under Rabin as the director general of the Foreign Ministry, disclosed last week that already in 1975, Rabin had told him discreetly that Israel should be withdrawing roughly to the 1967 borders, because it shouldn’t be ruling millions of Palestinians. However, cautioned Rabin, Israel should first rehabilitate its deterrence vis-à-vis the Arabs, which had been harmed by the Arab surprise attack in the Yom Kippur War. Only then, from a vantage point of power, Israel should make the momentous moves required to preserve its Jewish character and its democracy. Only 18 years later he was able to make it happen. On Sept. 13, 1993, on the South Lawn at the White House, I heard him say that “we who have fought against you, the Palestinians, we say to you today in a loud and clear voice: Enough of blood and tears. Enough.” Millions of Israelis, who have been watching this with awe on their television screens, knew perfectly well that this wasn’t rhetoric only: Rabin the soldier, who had sent Israelis to die on battlefields, expressed their quest for peace. At the same time, the way he shook Arafat’s hand — or rather was coerced by President Bill Clinton to do it — conveyed to the Israelis a parallel message: I’m doing it reluctantly, because I care about your security, but I don’t have a better option. Rabin invested a lot of efforts in convincing the Israelis that he had chosen the right path for them. He said: “I believe that in the long run, separation between Israel and the Palestinians is the best solution for resolving the Israeli-Palestinian conflict. And at the same time he reminded them that “you don’t make peace with friends. You make it with very unsavoury enemies.” To say that Oslo was a bad gamble for Rabin would be the understatement of the century. It wasn’t even the ballots that put an end to his political career, but the bullets that took his life. Yet his legacy carries on, and unlike others who try to define what that legacy is, to me it’s clear: With the kind of challenges Israel faces, and for Israel to exist and prosper, it needs leaders who are statesmen, not politicians. People often ask me what would have happened today had Rabin not been assassinated. I usually refer them to a book by English historian E.H. Carr titled “What Is History?” Carr dismissed the theory of “Cleopatra’s nose,” promoted by French philosopher Blaise Pascal, who had claimed that if Mark Antony hadn’t fallen for Cleopatra because of her amazing nose, the Second Triumvirate would not have broken up, and therefore the Roman Republic would have survived. Ignoring Carr’s wise caution, though, I am willing to guess that Rabin today, regardless of internal political calculations, would have acted to safeguard Israel’s most important interest: remaining both Jewish and democratic. With a credible Palestinian partner, it means a Palestinian state next to Israel, with all the painful evacuation of settlements and the security risks involved; with the absence of one — unilateral moves. One thing for sure: Doing nothing wasn’t an option for Rabin. Except that he is not with us anymore. Uri Dromi is director general of the Jerusalem Press Club. He served as spokesman of the Yitzhak Rabin and Shimon Peres governments from 1992 to 1996, during the Oslo peace process as well as PM Rabin’s Chief of Staff. ← What it means to be a Liberal Democrat today.